Is this what you see when you start AutoCAD? If so, you’re not alone because it’s the default setup. But you hate it, don’t you? Here’s how to get rid of the Welcome window and the grid. At the bottom of the Welcome window is a checkbox, Display at Startup. Uncheck it. Then close AutoCAD. 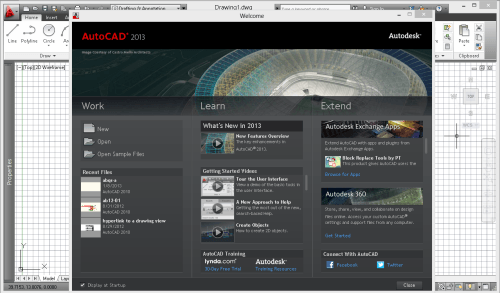 The next time you start AutoCAD, you won’t see the Welcome window. But you can get it back if you want. It contains a list of “Getting Started” videos that you might want to view. You can also find Autodesk Exchange Apps. To get back the Welcome window, click the down arrow to the right of the Help button — it looks like a question mark. Then choose Welcome Screen from the menu that drops down. The Welcome Screen will open, but the Display at Startup checkbox will remain unchecked. In this way, you can display the Welcome Screen any time you want, but avoid seeing it for the vast majority of times when you don’t want it. Turning off the grid is a bit more involved, because you have to change a setting in your template. If you use multiple templates, you need to change them all. Open the template you usually use. If you use the default, acad.dwt, open that. The location will depend on your release and version of Windows. You might have to search for it in Windows Explorer, because the folder path is very long! When you find it, you can double-click it to open it. If you’re navigating from within AutoCAD, be sure to choose Drawing Template (*.dwt) from the Files of Type drop-down in the Select File dialog box. This will automatically put you in the default Template folder. Click the Grid Display button on the status bar or press F7. Do you have another method? 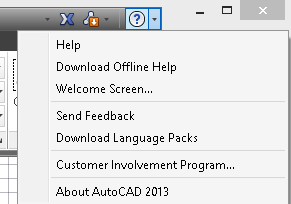 For example, do you have an AutoLISP program that you run automatically when you start AutoCAD? Besides customizing your template, what do you do to make sure that AutoCAD starts the way you want it to start? Leave a comment and share!